If you have not yet experienced a Brazilian Blowout, it’s time to try it, for your smoothest, softest hair ever. After undergoing this revolutionary hair treatment, our clients are excited about how sleek, smooth and soft their tresses feel. Brazilian Blowouts eliminate frizz and tame even the thickest and curliest of hair. Our salon is certified to provide this special service, and our stylists are highly trained and experienced. Don’t accept imitations. To get the real Brazilian Blowout, you must go to a certified salon that has trained staff, the proper products and sound ventilation. 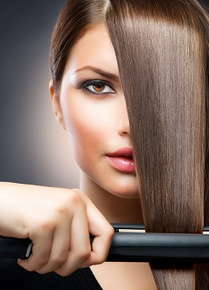 Our product is keratin based. Keratin is a protein that binds to your hair shaft, surrounding it with a protective layer and smoothing your hair’s cuticles. The amino acids form a seal around the cuticle, which decreases frizz and curl for several months. Our Brazilian Blowout treatment takes about 90 minutes. When we are finished, you will be able to resume styling your hair as usual, with no downtime. Your treated tresses will continue to look smooth and sleek for months, even after washing it or going for a run. The end result? Hair that looks naturally healthy, shiny and radiant. Wavy hair will be straight while curly hair will be smoother and frizz free. Treatment results last up to four months. We can color your hair and then give you a Brazilian Blowout in the same day. However, if you want to color your hair after the Brazilian Blowout, we recommend waiting two weeks. Are you ready to try this innovative hair treatment that can help you avoid relaxing or straightening your hair for up to four months? Call us today for smooth, beautiful hair.